December 3rd, 2015. 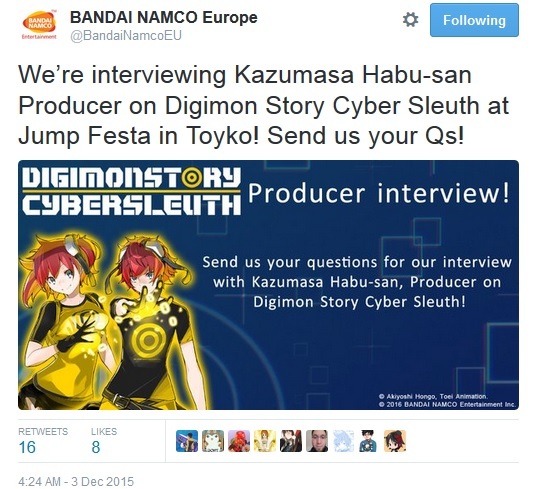 Bandai Namco EU announced over Twitter today that they will be interviewing Digimon Story: Cyber Sleuth producer Habu Kazumasa at Jump Festa 2016, and the company is asking fans to submit their own questions. This year's Jump Fetsa will be held over December 19th and 20th at the Makuhari Messe expo center. Jump Festa 2016 is currently set to host Digimon World -next 0rder-, which Habu will likely be presiding over as producer. Habu has been the producer for all Digimon games since Sunburst & Moonlight in 2008. This will be his fifth interview on Cyber Sleuth; Habu has been very open to questions in the past, doing interviews with Anime News Network, DualShockers, The Koalition, and Gematsu.